This week Colorful has introduced a uniquely designed motherboard, created specifically for the professional miner. One of the first things most will notice is this doesn’t look like most motherboards we see on the market. 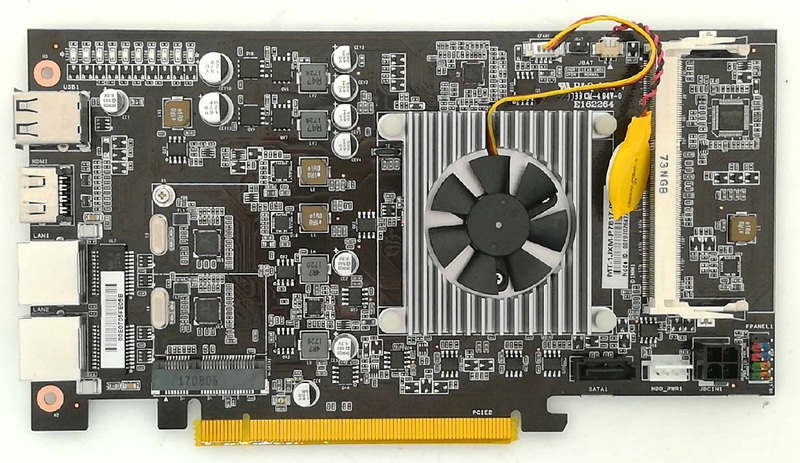 Instead of conforming to any particular form factor, the C.J1900A-BTC Plus V20 breaks that mold and gives us a markedly rectangular shaped board with a total of nine full-length PCIe slots. 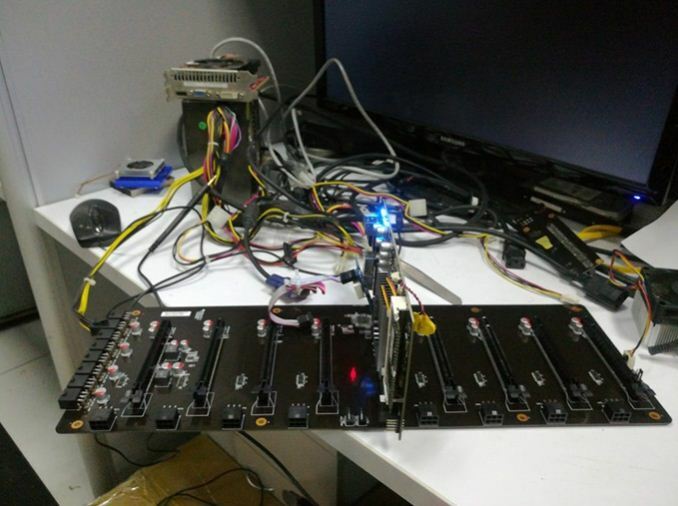 Eight of the slots can be used for installing mining graphics card of choice while the blue slot in the middle is where the Celeron J1900 SoC resides on its own PCIe card. The SoC itself has a DDR3 SO-DIMM slot, a mSATA slot, and regular SATA for storage; it also contains the board’s connectivity like networking, USB, and video output. 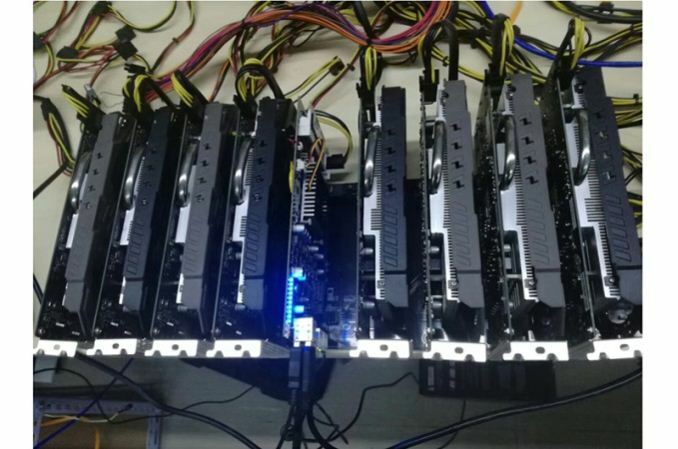 With the price of a single bitcoin breaking the $7000 barrier recently, GPU mining has not lost its draw of profitability, especially with alt-coins. We have seen a few Intel board partners come out with purpose made mining motherboards cramming in well over a dozen PCIe x1 slots on a single ATX form factor board in order to reduce the per-system cost of mining infrastructure. The lower the outgoing cost, the quicker miners are able to get their money back. To that end, Colorful introduced the C.J1900A-BTC Plus V20 with enough room for eight cards without the use of riser cables. The board offers double slot spacing between each slot and looks to be around 16-inches in length and almost 7-inches wide throwing aside any standard form factor out of the way. 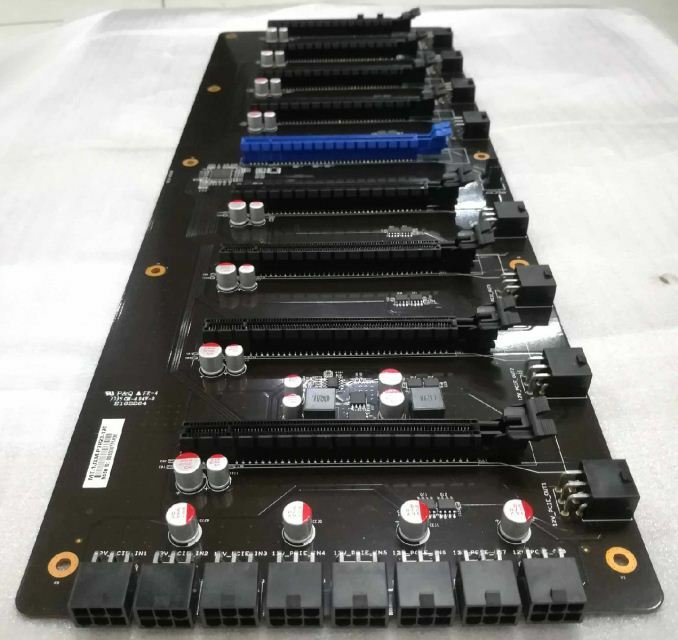 Power is delivered to the cards through a total of sixteen 6-pin PCIe power connectors with eight located on one end and eight around each of the GPU slots. According to the specifications, the Celeron J1900 SoC is based on Intel's Bay Trail and is a quad-core processor with a base frequency of 2.00 GHz, a burst frequency of 2.42 GHz, and fits within a 10W TDP. It has one DDR3L SO-DIMM slot supporting DDR3L 1066/1333MHz. Graphics duties are handled by integrated GPU (HD Gen 7) with speeds up to 854 MHz. Regarding I/O and expansion, there is one mini PCIe M-SATA slot, as well as a single SATA port and a 4-pin EPS 12V for power. Other connectivity includes two Realtek RTL8111E Gigabit LAN ports, HDMI output, and two USB2.0 ports. Form Factor Approximately 15 x 7 in. Pricing nor availability was listed at the time of this writing. We expect it to be available within the coming months for Colorful customers, although retail availability is unknown. IanCutress: @KevinMulhall I never have problems.